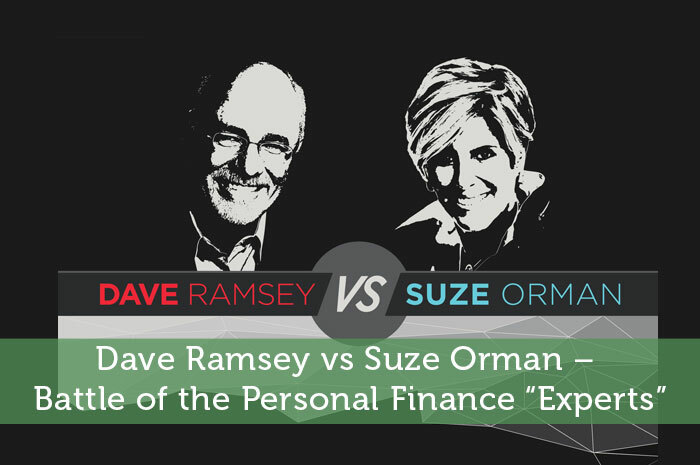 There are two power players when it comes to personal finance, Dave Ramsey & Suze Orman. Dave says to have a $1,000 emergency fund immediately. Suze says to save a little bit at a time. Each one has their different ways of doing personal finance, below you could find one who works best for you, or even just find advice from both that can help you in your daily life. Actually, I think Dave’s #6&7 are reversed. He advocates building wealth and giving as his last step. Actually, the two aren’t so different. Dave advocates saving $1000 as quickly as possible but he knows you have to do it a little at a time, so you have something available for smaller emergencies. Then he continues to recommend you save for the 3-6 months EF. I think Dave is a little more kind hearted speaking from the Christian point of view. Suzi is a little more matter of fact and blunt.Both have very valid paths to becoming debt free. Ramsey’s plan help my family and I pay off $100K in debt. I’ll always be a Dave fan. His debt free screams are so motivating! This is such a great comparison between the two influential personal finance experts. For me, I would follow Suze Orman, I want to start a investing a small amount. Nice breakdown and a great share. Although I’ve heard of both personal finance experts, I’ve personally never read anything they’ve written. Based on the infographic though, I think I’m more of a Suze Orman. However, you can’t always just be one or the other. I’m sure a lot of people are a blend of both Dave and Suze. This is too fun to have as an infographic. I enjoy listening to both Dave and Suze, but I think Dave has more of a grasp on what will really help indebted people to climb out of the pit. He gets the emotional and psychological aspects of the game more, whereas Suze seems to be more of a “by the numbers” gal. Long term hers makes more sense, but I think Dave’s advice is more likely to actually help people. Love that graphic. We have never listened much to Dave Ramsey, and Suze got us through our early years of debt repayment, building up emergency savings, etc. Now that we’re in early retirement savings mode, we have to rely on the blogosphere, since none of the high profile experts are charting a course on that! I listen to Dave and Suze. Both are really practical. Their methods are not that different. I love the debt free scream and I really like Suze’s “can I afford it. However, to me, Dave will always take the lead because bible focus.